I’m pretty much obsessed at this stage with face masks and am forever discovering and trying new ones! Not only does a good one keep your skin happy and under control, they also give you a bit of much needed chill time to yourself and for the most part (I’m looking at you semi painful/ harsh peel off black head/ actual face removing ones, popular from a while back!) just feel really good to do…treat yo self! Anyway especially recently with so many available now, I’ve found myself particularly drawn to sheet masks. I love the convenience and minimal mess (super handy for travel too)! Weirdly enough though, neither of the masks that I’m using/ loving at the moment/ talking about today are! I have one peel off (that doesn’t make your face fall off as well as the usual pore contents!) and one made of jelly (yes)! Both cruelty free, vegan and not at all spendy…bonus. The fist one is from 7th Heaven (the brand also well known as the forever miss-pronounced ha ha ‘Montangne Jeunesse’)…a UK based, cruelty free accredited for over 30 years brand specialising in masks. Many of their masks are vegan too. The range is huge, not only for the face (they also have masks for hair, feet, eye area/ nose specific and hands too!) and all kinds of formulas…mud, sheet masks, self heating masks, exfoliating ones…basically they cover all mask bases and are so inexpensive too! 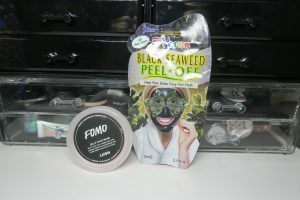 The mask that I’m really liking at the moment is their Black Seaweed Peel Off Mask* which is packed full of marine goodness in the shape of sea salt, crushed sea buckthorn and plenty of Welsh (from my very own homeland) lava seaweed. Super satisfying to peel off and gives your skin the perfect detox, leaving your skin deeply cleansed, balanced and smooth (you’d be surprised how many dead skin cells you can actually see on this after peeling it off, eww but effective!). This one is suggested for all skin types although it’ll be more beneficial to a normal – combination/ oily skin and with it being exfoliating, I’d stick to once a week! I like how this one preps my skin for the next one I’m going to talk about too! I’ve tried quite a few of their masks over the years and will still pick up a few when I see them as well as keeping an eye out for new ones. Great masks, cruelty free and super affordable! See the whole 7th Heaven range on their website and you can pick up their masks from most places, including Boots, Asda, Wilko, Claire’s, Bodycare, Morrisons (basically your usual high street culprits) and online at 7th Heaven on Boots*, Amazon* and boohoo.com too! 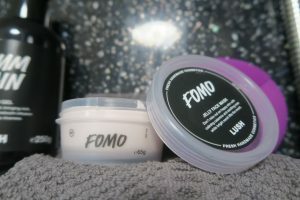 Next up the FOMO Jelly Face Mask from Lush. I must be on a seaweed kick at the moment, these jelly masks contain seaweed (known for its calming and hydrating qualities) as well as a blend of cleansing clays, fresh fruit and carageenan extract for moisture (and responsible for the masks satisfying and squidgy jelly texture). Packed full of natural ingredients and they’re self-preserving so they can live in your bathroom, not your fridge (more space for foods, yas!)! You take a really small amount of the jelly (the pot’s lasted ages so far!) on to your dry hand and massage you palms together until it turns in to a cream. Smooth it on, leave for 10 minutes and done! I wash it off with a wash cloth and warm water and it just leaves your face soft, relaxed, radiant and ready for your skin care and/or makeup. There’s 5 Jelly Masks to choose from…FOMO is the first I’ve tried (they’re pretty new) but definitely not the last! It’s a baby pink jelly with a light floral scent (I’m not usually big on floral scents, but this smells lush!) which it gets from rose and neroli oil. Calamine soothes and calms and super hydrating and replenishing, like a drink for your skin! I use this one after any peel off/ more exfoliating and clarifying ones, just to replace moisture and calm and I also use it as and when just to give my skin a boost. With it being self preserving (the jellies have a 4 month shelf life which is amazing for a fresh/ natural mask!) it’s great for traveling too, so it’ll be coming with me every time I do! 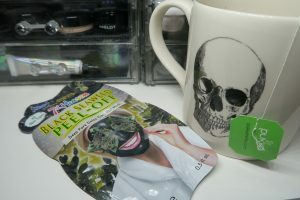 When I’m next near Lush, I think I’ll pick up the 1000 Millihelens Jelly Mask packed with antioxidant green tea (which I love!) and has a crisp sweet apple scent, yum! What are your Lush essentials? And any mask suggestions? You can never try too many of either!